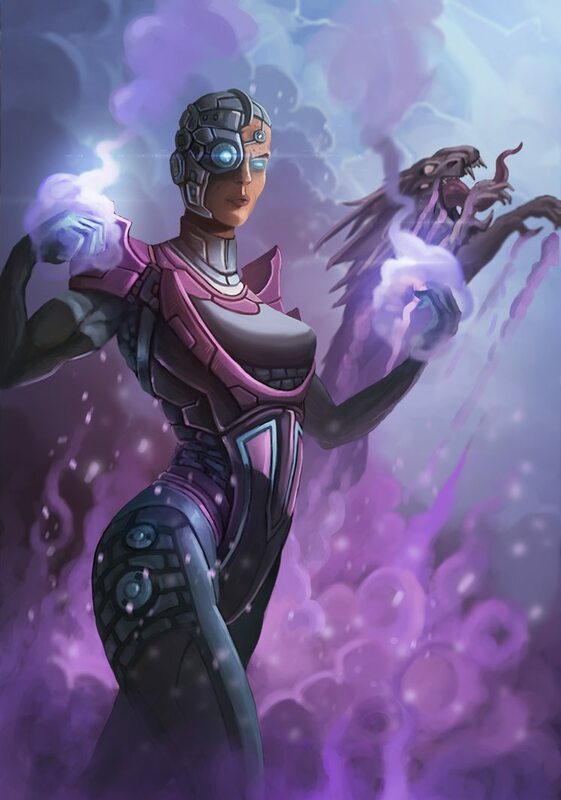 Today we introduce Livewire – the newest Gladiator to join the Ophidian Games, illustrated by Patrik Björkström. Erin Bash’s life changed drastically the day someone broke into one of Helix Co.’s top secret labs. A natural Psionic, she was a natural fit as a security guard, since her abilities allowed her to foresee her opponent’s moves. A demon Gladiator was there to steal some experimental cybernetics for his masters. When she was attacked, her ability allowed her to avoid death, dodging out of the way of the attack at the last moment. Still, her injuries were quite grievous. The leading lab Tech, Carson Loeb, used experimental cybernetic implants to save her life. She was stabilized, but is in constant inexplicable pain. The implants also boosted her Psionic abilities tenfold. After that incident Livewire left Helix Co.’s lab with only one agenda: revenge on the demon who attacked her and turned her life upside-down, his sword emblazoned in her memory. Livewire’s victories come at a price – she is always left with an imprint of the memories and personality of her victims. None are ever quite as strong as Carson’s, and she will sometimes find herself talking to him, both to comfort him in his perpetual pain, and to find some solace and comfort in who she has become. Eventually she tracked down the demon that ‘created’ her, learning that he was a Gladiator, and decided to join the Ophidian Games. She yearns for the day when she can face her attacker in the arena and exact her revenge. 2358 Erin Bash injured during a break-in in a Helix Co.’s top secret lab and to save her she needed Tech implants. 2359 During training with her expanded Psionic abilities Erin discovers that she is also a Summoner. 2360 Erin Bash becomes to be known as Livewire and enters the Ophidian Games to find a new purpose and take revenge on her attacker and the forces behind him.